Guess what? I had the fun opportunity to go to a homeschool convention the other weekend! 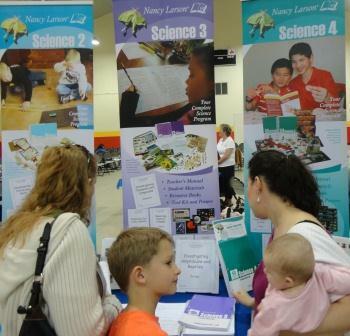 I was invited to help with the Nancy Larson Science vendor booth at a Houston convention. Punkin and I were very excited! We loaded up our car and headed out on Friday morning. It was about a 3 hour drive – well, a little longer if you factor in the stops to feed and change Punkin. But we made it to the convention in Houston without getting too lost. I did call my hubby once for a little navigational help……. 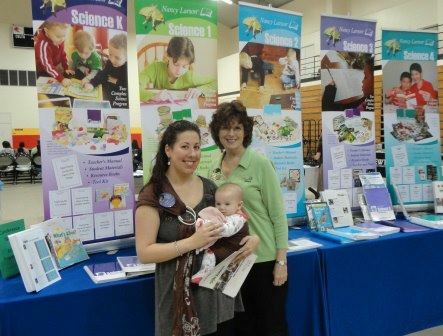 I spent all Friday evening and most of Saturday chatting with homeschool families about science – and about almost everything else under the sun! It was so fun to share our homeschooling experiences with them and answer their science questions. And we ended up talking about preschoolers, homeschooling in highschool, college admissions, babies, transcripts, diapers, minivans, math with manipulatives, reading, textbooks, schedules, family, and finding balance. By Saturday, I was exhausted and my brain was about to explode! I was on curricula overload! How do you schedule things with littles? Umm……I schedule my day around their little routine and I use the big kids to help entertain. Plus, I have a plan with activities and games all ready to go for when I need them. Can you get into college? I was homeschooled in highschool and I got into college just fine. So, I’d say yes on this one! I keep notebooks of our papers (It’s our portfolio) and when my kids are older, I’ll give them grades and create my own transcript. There are several great resources to help homeschoolers keep track of papers and grades and even create a transcript. I decide how many lessons per week I want to cover in each subject and then we aim to get them done – even if we end up doing most of history on one day and most of our science the next. I have a weekly plan. Can you choose your own curricula for each subject? Yes, you can structure your plan however you like. You can break away from boxed curricula! Or, you can use pre-packaged curricula. It’s your choice! Have you ever tried to teach complicated science concepts to a 7-year-old with a toddler and preschooler running loose? I follow the script because it builds on itself and has a wonderful incremental approach. I also use the script so that I don’t have to plan ahead. I just don’t have that kind of time right now! Why would you combine kids? To make it easier on yourself! I’m combining Tiger and Bee in science next year and I so look forward to teaching the same topic to both. And how much fun to have something they can do together! I’m all about combining for history and science! 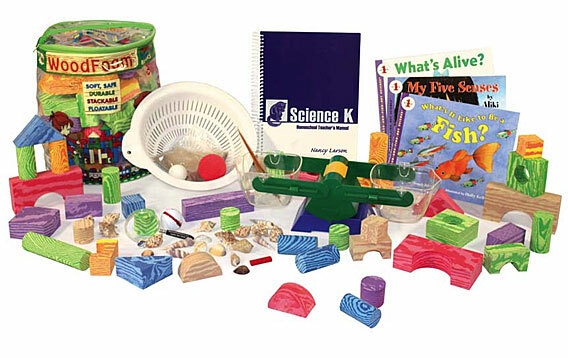 The program has an activity, observation, or experiment for each lesson. In the lower levels, there are less experiments and more observations. I love this because I don’t have to make a giant mess, direct a complicated experiment, and lose the interest of my kids. Instead, the activities are perfectly geared for their ages and they are able to complete them without my help! Is it a full year of curricula? Yes! We add in a few extra book choices and do 2 lessons per week (using 2 other days as review/extra reading days). It’s a good pace since we have to spend much of our time focused on language arts and math. Why is it not by grade? Because it’s more about ability level and it allows you the opportunity to combine kids. What are the projects and activities like? We have observed a pinecone opening, watched caterpillars turn into butterflies, and built a human skeleton out of x-rays. They provide you with a booklist that goes through each lesson, providing book choices for each lesson. These books are ones that are easy to find at a library. I plan to purchase a few key books to keep on hand during our year. We love to read! Can I reuse the curricula? Yes, everything in your kit can be reused with another child later. You just need to purchase an Individual Student Unit to have all the booklets and review worksheets. I am keeping my kits to reuse them with all my kids! I would appreciate you using my affiliate link by clicking on the banner below. This enables me to continue using the Nancy Larson Science program with my own children! Thank you!